Alyssabeths Vintage: Christmas Jewelry SALE ! I can't believe it, but Christmas is only 5 days away and I still have gifts to wrap and cookies to bake! I also can't believe that today is the last day for holiday shipping. I still have a few Holiday jewelry pieces in my store and have marked these down, so think of stocking-up for next year! Pink Chic Christmas Wreath Cameo Necklace Vintage Style Rhinestone & Snowflake Charms. 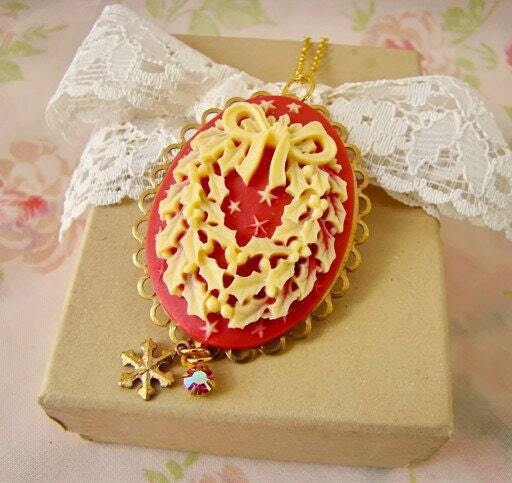 SALE - A very chic, vintage style Rose Pink & Cream Christmas Holly Wreath Cameo Pendant Necklace. This lovely and elegant necklace features a large Christmas wreath cameo in antique brass lace edge setting accented with a little vintage antique brass snowflake and tiny pink swarovski rhinestone drop. 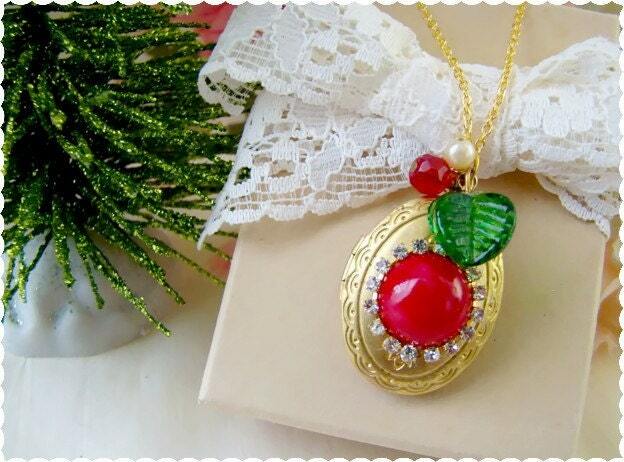 Christmas Cheer Sparkle Locket by Alyssabeths. SALE - Elegant, bright and cheery Christmas Sparkle Locket featuring a lovely oval brass locket adorned with a repurposed vintage ruby red round glass cabochon framed by bright clear rhinestones. Locket is adorned with charms created with a vintage emerald green glass leaf, tiny ivory pearl & ruby red faceted Czech glass bead. 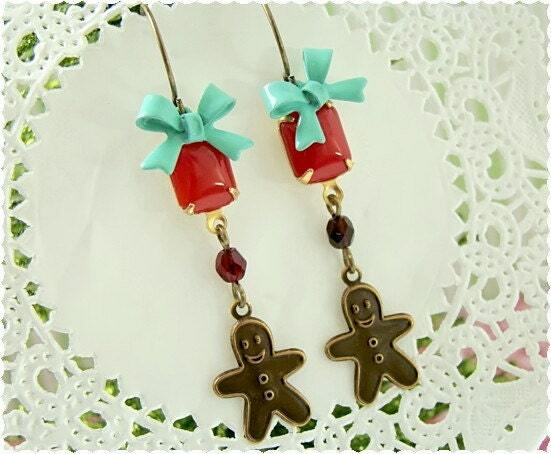 Yummy Gingerbread Men Vintage Jewel Assemblage Earrings by Alyssabeths. 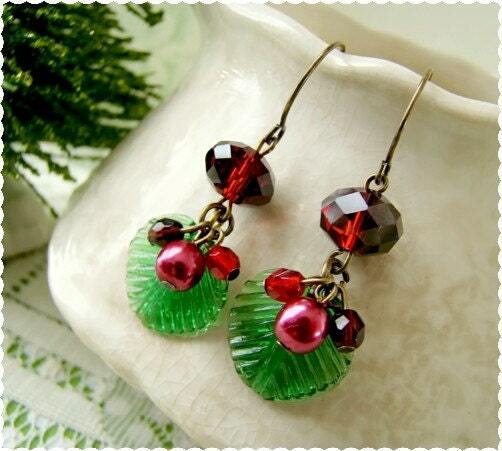 SALE - Fun and flirty Christmas earrings crafted with an assemblage of vintage glass jewels and charms. Each long dangle earrings features a vintage red octagon milk glass jewel set in antique brass, aqua enamel bows, tiny ruby red Czech glass faceted beads and then a precious antique brass gingerbread men charms. Vintage Chic Christmas Holly Berry Earrings by Alyssabeths. SALE - Festive and elegant, vintage styled Holly Berry earrings crafted withrepurposed vintage emerald green glass leaf beads, dangles of cherry and burgundy red glass pearls and tiny faceted Czech glass beads, all suspended from claret red faceted Czech glass oval beads.